This BMW 1M is a beautiful car. The vehicle came to us with upgraded downpipes, intake system and an upgraded cat-back exhaust. Base power, equipped with a JB4 piggy back, showed the vehicle running high boost but not putting anything impressive down with power. The base power pull showed 200hp and 260tq. 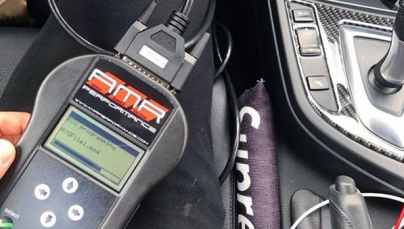 We removed the JB4 piggy back and went forward with reprogramming the factory ECU with our custom AMR Performance stage 2 software. Gains in our Stage 2 Tune compared to the base run were very impressive. The AMR Performance Stage 2 tune put down 365hp and 420tq! Torque instantaneous! The vehicle is definitely track ready! This BMW 1M is a beautiful car. The vehicle came to us with upgraded downpipes, intake system and an upgraded cat-back exhaust. Base power, equipped with a JB4 piggy back, showed the vehicle running high boost but not putting anything impressive down with power. The base power pull showed 200hp and 260tq. We removed the JB4 piggy back and went forward with reprogramming the factory ECU with our custom AMR Performance stage 2 software. Gains in our Stage 2 Tune compared to the base run were very impressive. The AMR Performance Stage 2 tune put down 365hp and 420tq! Torque instantaneous! The vehicle is definitely track ready!